I just wanted to write and thank you for your wonderful cane flute! I have been using it for over a year since becoming disabled due to an injury. I last took my cane flute to Chiapas, Mexico, on a mission trip with our church. Being that you're on this page I'm guessing your just a little curious about Serenity Bamboo Flutes. Our small bamboo flute business consist of three people. Linda/Nick Barbadoro and Jim Ferere. The three of us have been friends for many years. We grew up in Philadelphia, Pa. during the 50's and 60's. Linda grew up in a section of the city called Olney. Jim and I grew up grew up in an Italian section of Philly called 'Swampoodle' which was also the location of Connie Mack Stadium (old Shibe Park). In the fall of 1974 Linda and I left Philly and moved to the town of Stockbridge Massachusetts. Located in the beautiful rolling hills of the Berkshire mountains (pop. 1865). We moved into a one room cabin, 12' x 17', without running water or electricity and an old rickety Ashely wood stove for heat. We slept in a small loft that you could only sit up in. That first winter was amazing! The weather was very stormy with a deep cold freeze. But no matter how cold it was outside we were always nice and toasty in our little nest. The wood stove served us well. We learned quickly what wood to burn and when. Pine was to be avoided but hardwoods were ideal when dried. Ash could be burned right after splitting. If we wanted to go out for a few hours we would toss in a chunk of elm. That guaranteed a good bed of hot embers for when we returned. That stove burned 24/7. Once a week we would empty the ashes. I learned that winter that a home was much more than a house. In 1978 our friend Jim moved up to the berkshires and we have all been here ever since. For all these many years we have earned our way by making and selling our unique style of dark bamboo flutes, walking sticks and walking stick flutes. We sell mostly at juried craft fairs and music festivals throughout the Northeastern United States. We do over 30 shows a year which puts us on the road for about 80 days. 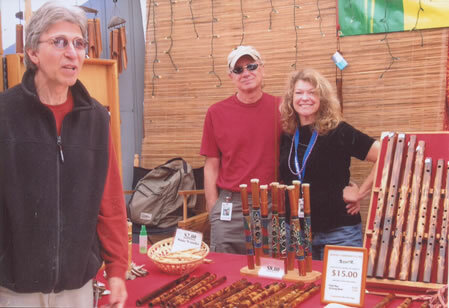 We were the first to develop and sell our line of amazing walking stick flutes which have been featured in publications such as Signals Catalog, Real Goods and Backpackers Magazine. We first began making our bamboo wood flutes during the fall/winter of 1974 when friends of ours living in Stockbridge, Art and Ann, wanted to try and make some bamboo flutes. At that time I was playing a concert flute in an amateur orchestra in town. The flute I was playing was a solid silver Gemeinhardt French model with low B foot. An awesome flute. I offered to help if Art and Ann in tuning the bamboo flutes if they needed it. They did, one thing led to another, yada-yada-yada, and here we are 40 years later. Ya gotta wonder......! The early years of our craft business consisted almost exclusively of doing craft shows held inside shopping malls. During the 70's and 80's mall craft shows were very popular. A typical mall show had anywhere between 75 to 150 craftspeople exhibiting their wares. You had to be juried into the show and could only sell what you made. Mall shows usually started on a Tuesday or Wednesday morning and ended Sunday night. You were selling in the mall twelve hours a day, 10 to 10. Kiosks that you see today in mall aisles are a direct descended of the old mall craft shows. Many craft venders would park their vans and campers in a back corner of the mall parking lot and camp out there for the duration of the show. Sometimes we would get together on a Saturday evening after the mall closed and have a cook out and hang out in the parking. You basically lived at the mall for four or five days at a time. One January night we were parked in a mall lot in the middle of a winter storm. I remember looking out of our van window and seeing this completely barren parking lot with the snow flying and the wind howling. It looked like a paved tundra! But we had a good camper heater and we were as snug as a bug in a rug. That night the van was really rock'en! By the late 80's mall shows began to lose their luster with the public and we were also getting pretty sick of doing them ourselves. We started phasing them out and began attending more outdoor craft fairs and music festivals. Our work season completely reversed. Instead of working during the winter and having summers off we now worked during summer and had winters off. Outdoor craft fairs usually run for one or two days, over a weekend. The longest fair we attend is the 'Eastern States Exposition', better know around here as the 'Big E', held mid September in Springfield, Ma. It runs for 17 days. In August of 1979 we were blessed with the birth of our daughter Amelia Barbadoro. She was our 'little green bean'. The following month we were booked to do Eastern States. Lia was kept under the table in a beautiful woven basket given to us by a dear friend. We quickly learned that babies are very resilient. Lia went everywhere with us. She came along to all our mall and craft shows before starting school. We live on the same spot we moved to when we left Philly in 1974. Some things have changed in our area since then but thankfully not much has changed around us. Our flute shop is in the basement of our home. We have a large vegetable garden and a good size berry patch. Well that's the 10 cent tour. I know I yada, yada'ed over 40 years of our past but maybe I'll save some of those stories for another time. Your Friends at Serenity Bamboo Flutes.